The University of Liverpool has taken the Varsity title for the seventh year in a row after battling it out last week with sports teams from Liverpool John Moores University. The overall Varsity score was 89 – 63 with some tense moments across the three-day sports clash. Particular highlights of this year’s tournament include the trampolining squad who took a win this year after losing out by only one point last year; and men’s indoor cricket who won their fixture after not being involved in Varsity for a number of years. Both men’s football teams had excellent results against teams who normally play in higher divisions, with our 1st team fighting until the end for a 0-0 finish and our 2nd team romping to victory 4-0. There was also great success in both handball and Jiu Jitsu who both overcame last year’s defeats to claim victory this year. 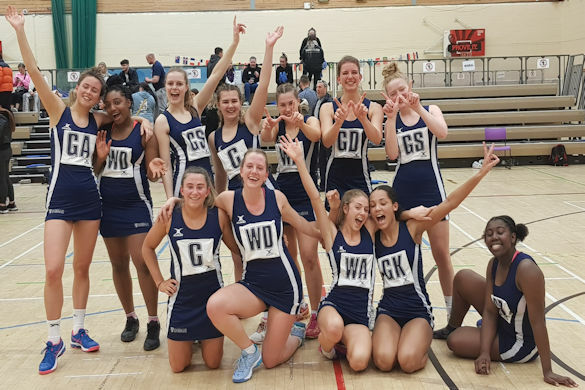 There were some nail-biting moments in a few games, not least in the men’s basketball where the team were pipped to the win in the last 30 seconds 67-70; and netball, which saw a tense win with a 42-41 scoreline. Throughout the week our Athletic Union supported the Rainbow Laces campaign by wearing laces with every colour of the rainbow throughout the week at training and fixtures. The campaign aims to show support for the LGBTQ+ community and to demonstrate our zero tolerance policy towards intolerance. We’ve added in some of our favourite photos from Varsity 2019 below. Enjoy! Our men’s indoor cricket team won their fixture after taking part in varsity for the first time in years. Welcome back! It was a win for badminton!